Banter with Ben and Lisa is back! We had a little hiatus for various personal scheduling conflicts, but I’m happy to announce that the podcast is back on track. On this week’s episode, we discuss a wide variety of topics, starting with my recent trip to France, Lisa’s training for the LA marathon, and all the scuttlebutt surrounding a giant boulder being shipped into Los Angeles. Plus, we discuss Internet sensation Marilyn Hagerty and her Olive Garden review, and we also take on Snooki, Lindsay Lohan, Jessica Simpson, Britney Spears, and Shia Labeouf, among others. Take a listen! And remember you can listen to Banter with Ben and Lisa on the Sideshow Network, and you can subscribe on iTunes here. Plus, don’t forget to like us on Facebook! We all enjoy a good photobomb. But photoboming a star? Well, that’s just legendary. Gwyneth Paltrow is just like us! YEA OR NAY: The Sexiest Man Alive Is… Bradley Cooper? Really? Okay, ladies and gents. Time to vote with your loins. People just announced that the Sexiest Man Alive is Bradley Cooper — he of the smarmy rictus and greasy hair (a.k.a. devilish grin and luscious locks, for those who are decidedly in the pro-Cooper camp). As OMG points out, many people aren’t thrilled with the choice, especially when others like the omnipresent Ryan Gosling seem a much better fit for the title. Where do you stand? Is Bradley Cooper the sexiest man alive, or should someone else have won the title? And if so, who? Watch an Awkward Interview with Paz De La Huerta! Nevertheless, it’s a strained interaction, to say the least. So it’s official: Ashley (or is it Ashlee) is here in LA and still a troublemaker. If only we knew what she had done to incur the wrath of CVS. We know one thing for sure: she’s probably wiping one invisible tear away from her eye with her index finger as we speak. It must have been bad enough for Queen Elizabeth when she learned Prince William would be marrying the COMMONER Kate Middleton. 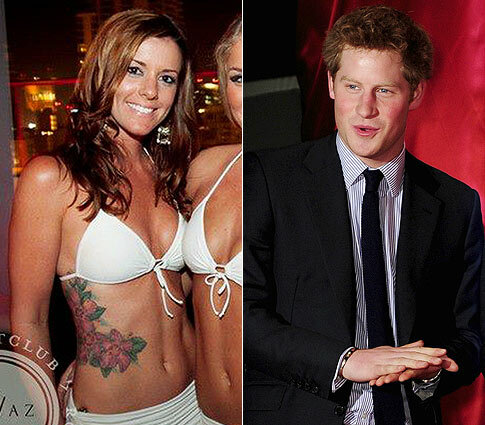 Now comes news that Prince Harry is canoodling with an American COMMONER (with a white trash tattoo on her torso to boot). Yes, the ginger royal, who’s been stationed in Southern California for military training, has allegedly made the acquaintance of Jessica Donaldson, a cocktail waitress at San Diego’s Andaz Hotel. No word on what the rest of the fam thinks about this budding relationship, but I imagine it’s only a matter of time before Prince Philip accidentally calls Jessica a whore trollop to the press. And yes, the physical similarities to Katie Midds have been noted. Madonna has issued an apology of sorts to hydrangeas, thanks to some help from the Godfather soundtrack. Chalk hydrangeas-gate up as one of my favorite -gates in quite some time.